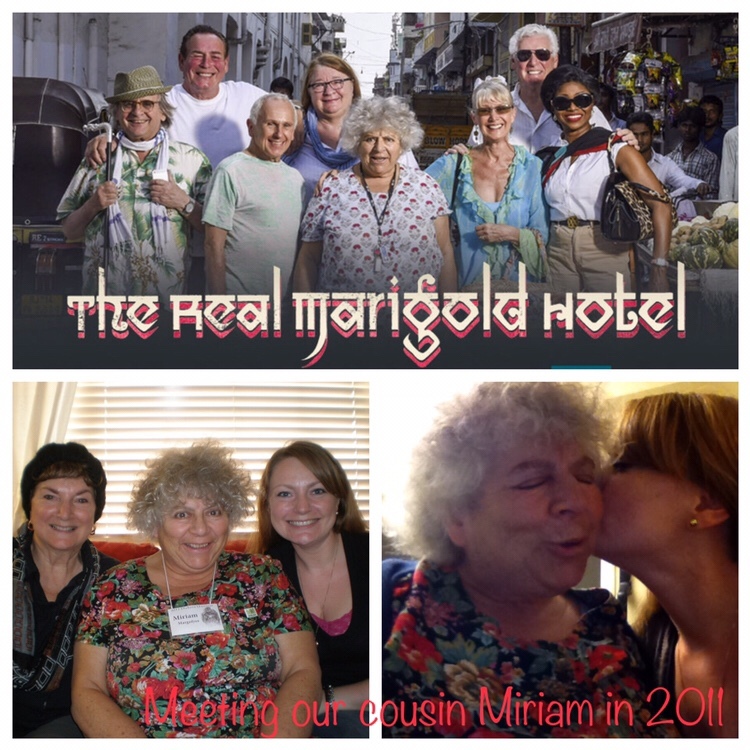 Thanks to a lovely email from loyal reader Bert in the U.K., Mama and I discovered “The Real Marigold Hotel” featuring our famous cousin, Miriam Margolyes. You may know Miriam as Professor Sprout in the Harry Potter movies, along with her impressive acting career in theatre and film. I loved her as Juliet’s nurse in Romeo & Juliet! Mama and I were thrilled when Miriam wrote to her and explained how we’re related several years ago! We got to meet Miriam when she came to Santa Cruz for the Dickens festival. We enjoyed spending time together and sharing photos from the family tree. Miriam even visited us again the following summer! It’s fun to watch Miriam on screen and remember the laughs we shared. Mama and I thought “The Real Marigold Hotel” was excellent. It’s essentially a reality show inspired by the movies, which we also loved. We so wished it was available on BBC America; since we could only get it on YouTube, we weren’t able to see more than the first two episodes. But we’ll keep trying! Today’s #OneGoodThing was watching cousin Miriam with Mama! Day 3 of 365. And Day 734 in a row (here’s the first 366 & the following 365)! Take care and my best to Mama!